Tarte flambee is also known as flammekueche, but I prefer a blog title I can pronounce. 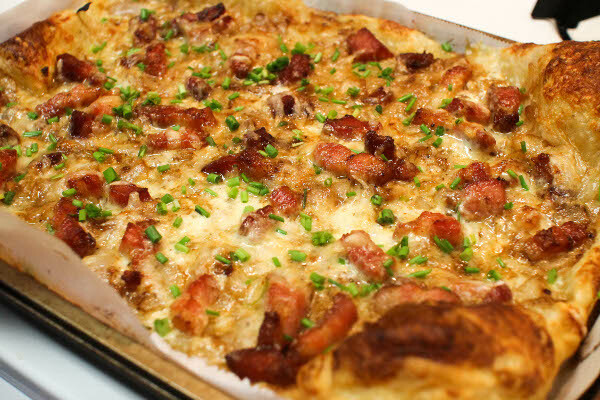 It’s an Alsatian dish of a rolled out dough and traditionally topped with creme fraiche, onions, and lardons. Lardons are strips of pork belly – essentially bacon. 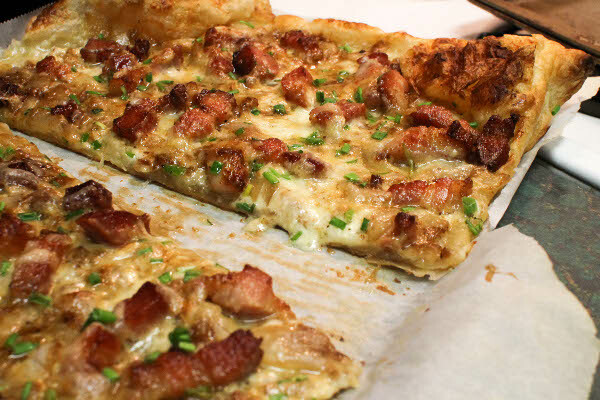 So you can think of tarte flambee as a fancy French pizza. But just because it’s French and fancy-sounding doesn’t mean it’s hard to make. In fact, I found out that it’s dangerously easy to recreate at home. The buttery puff pastry transforms into a flat base for the tarte flambe, and it is blanketed with two magnificent ingredients: thick cut bacon and creme fraiche. 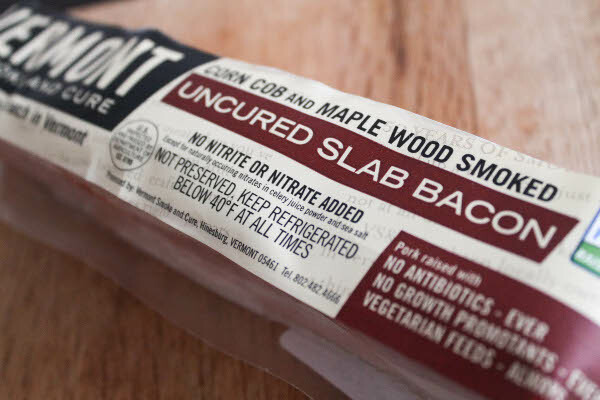 I bought slab bacon from Whole Foods but you can also use regular bacon and cut it into strips before frying. Once the bacon starts to brown, you remove it and cook the onions in the same pan, infusing it with the smoky bacon flavor. 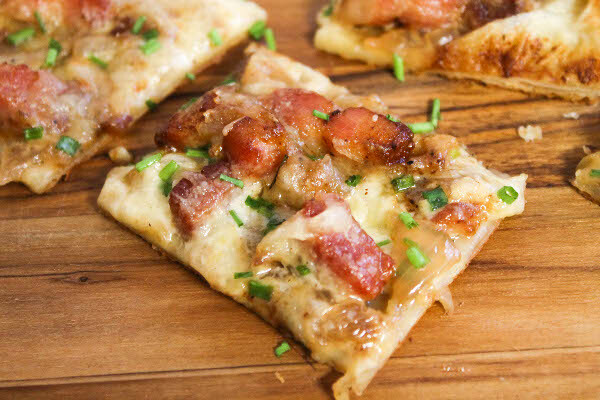 I suggest cooking a little bit of extra bacon because you’ll probably be tempted to nibble on it while making this tarte flambee. 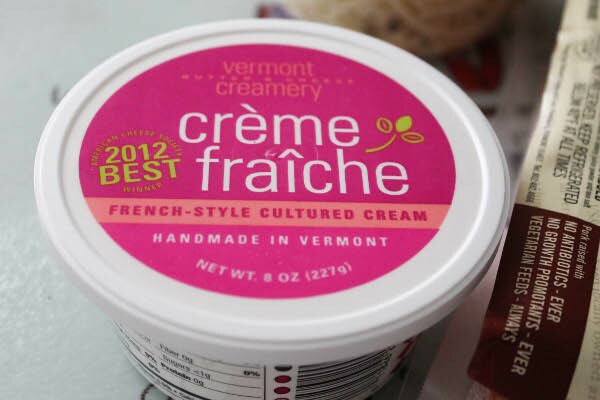 Creme fraiche is a rich and tangy cream, similar to sour cream, but even thicker. I saw other tarte flambee recipes use sour cream instead, or fromage blanc. But creme fraiche is the creamiest. If you want to cut back on calories, I suspect Greek yogurt could work too. I also sprinkled some shredded Gruyere on top, and finished it off with some fresh chives. Served with a simple side salad, this was an easy dinner, and also made for great leftovers. I really liked the creamy cheese and I especially liked the salty bacon strips. Tarte flambee, flammekueche, flammkuchen, Alsatian pizza, you can call it whatever you want. You can even skip the extra cheese and the chives. Just don’t skimp on the bacon. On a lightly floured surface, roll out your puff pastry. You can further stretch and flatten it using a rolling pin, so that it fits your baking sheet more evenly. Line a 9x12 baking sheet with parchment paper before fitting dough in. Place bacon in a medium skillet and cook over medium-high heat, stirring, until lightly browned and starting to crisp, about 7 minutes. Transfer bacon to a paper towel-lined plate and set aside. Drain all but 2 tablespoons of bacon fat and place skillet over medium-low heat. Add onions and season with salt and pepper; cook, stirring occasionally, until soft and translucent, about 12 minutes. Remove onions from heat and set aside. In a small bowl, mix together creme fraiche, salt, and pepper. Spread the creme fraiche mixture over dough. Top with onions, bacon, and grueyere cheese. Bake for 12-15 minutes, until the edges are puffy and golden. Sprinkle with chives and cut into squares before serving. 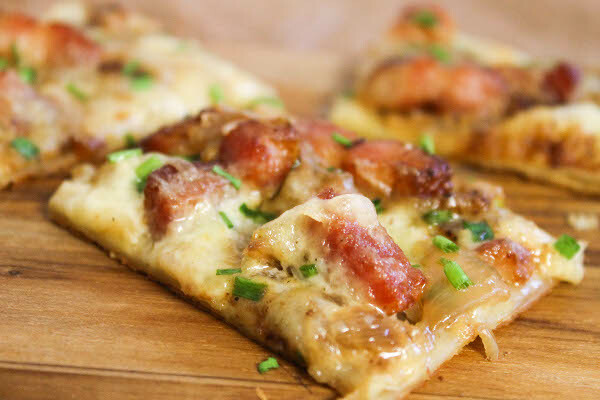 Have you ever tried tarte flambee? 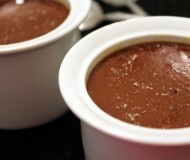 Do you have other easy French recipes? 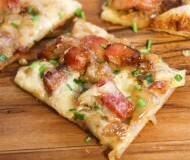 I love tarte flambée, and using a puff pastry base makes it even more decadent but lighter in weight too. Great idea. Bon appetit! OMG, I actually have all those ingredients on hand! Yay! This looks tasty. 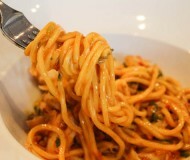 Bianca, this looks so good. i’ve never tried this.. kinda looks like pizza though. I don’t typically make French stuff, to intimidating. haha. This is perfect because I just bought some puff pastry for a baked brie! I love tarte flambee. Thank you for the excellent recipe! This does sound fancy! I remember the version we had at Sandrine’s was sooo good, and I bet yours is equally tasty. I’m pretty sure you can never go wrong when puff pastry is involved. Oh my goodness does that look mouthwatering! Amazing recipe. Must try for my girls’ nights, they’d go nuts! nice job! this looks amazing. Yum! That looks so good and so easy to make (my favorite type of recipe)! I love French food, and one of my goals this year is to foray into French cooking a bit more. I really want to learn to make macarons. I don’t know how I haven’t tried this yet! Great idea to use the puff pastry. This looks super delicious! Yum. I love the toppings and it looks perfectly golden. Wow this sounds like such a treat! It’s certainly a pizza to be reckoned with!! 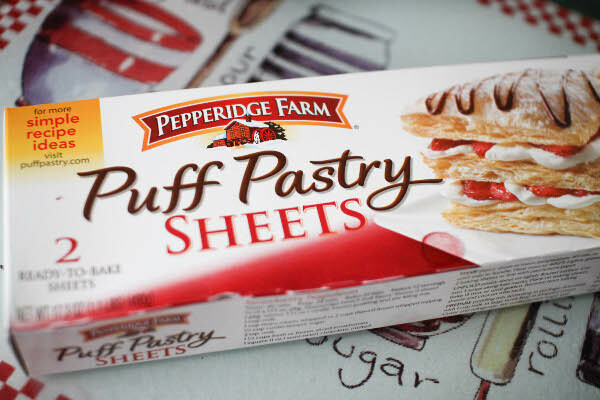 I have never had this, and I have never worked with puff pastry before. I would love to give this a try! Rhonda, I used to be so intimidated by puff pastry, but the frozen dough is so easy and tasty! Wow never tried something like this before but it has me drooling, looks fantastic! This looks amazing! My husband loves these (he is from Germany and his mom would always make this). I am still trying to perfect my own recipe :/ This looks so good I can’t wait to make it for him! no lie, you can put anything on top of puff pastry and make it edible, nay, delicious!